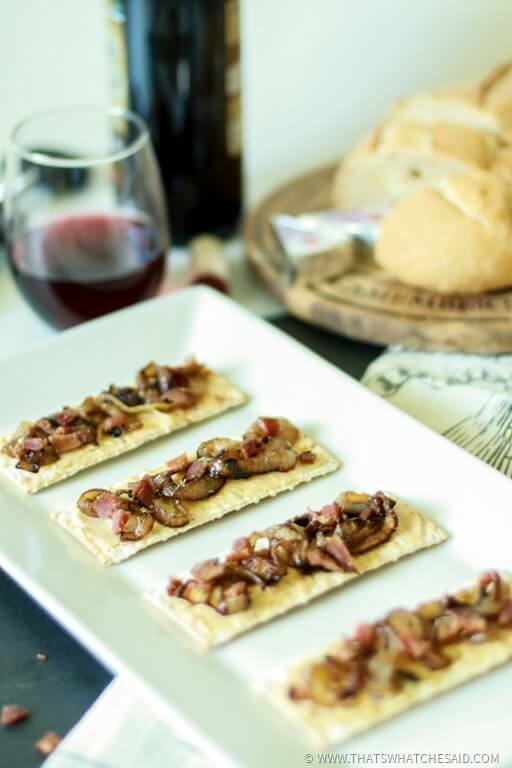 I have partnered with Cost Plus World Market to bring you a French inspired recipe today, a bacon and onion tart appetizer. Bacon. Onion. Together in finger food sized package. It’s mouthwatering. 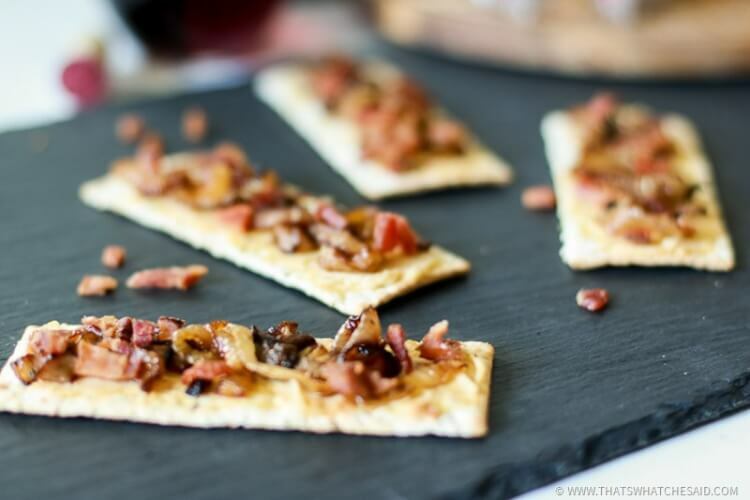 You still get the crispy crust, sweet caramelized onions and bacon flavors of a Tarte Flambée without a wood fire oven or all the prep time! 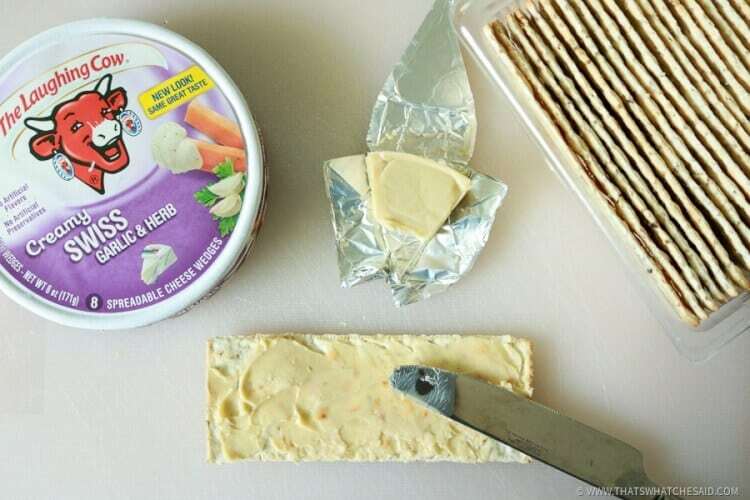 So easy and this can add a whole new level of gourmet to your next get together. 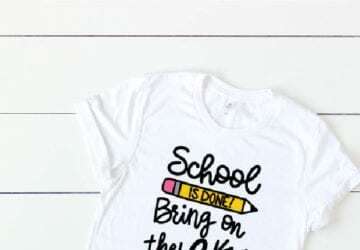 A quick note…my husband has already requested them again after eating all the ones I made for this post! He normally doesn’t comment much on what I make, he just eats it. So his request should say something! 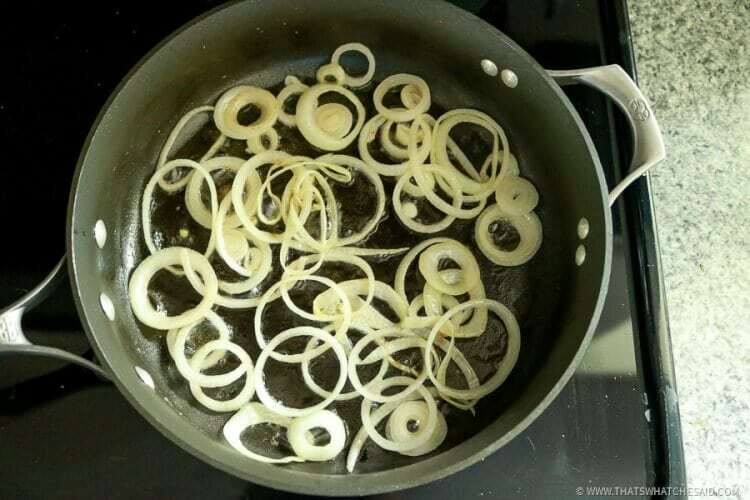 When you say French food to me, that can only mean one thing in my mind…French onions! I threw in bacon because, well…duh! It’s delicious right? I had such a good time strolling the aisles of Cost Plus World Market looking at all the amazing international food they carry! I can’t wait to go back and try something new! For today’s recipe, here is what I picked up! 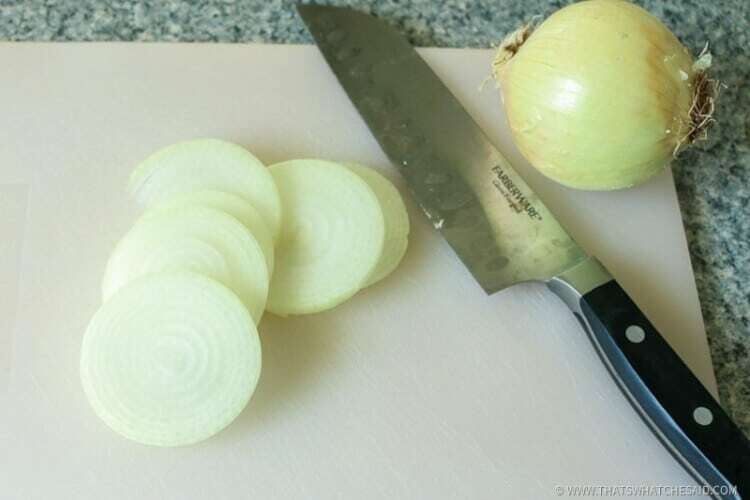 Using a sharp knife, carefully slice your onion, keeping all the slices the same size. In a skillet over medium-high heat, you will add olive oil and butter. A teaspoon of oil + 1 tablespoon of butter for each onion you sliced. When the butter melts add your onions to the skillet and stir to coat them evenly in the oil/butter mixture. DO NOT WALK AWAY. Do not pick up your phone and think “I’ll see what color Cheryl is on for her Rainbow Instagram Feed” <—I mean do this, but AFTER you have caramelized your onions, deal? These need constant attention and stirring. It will be worth it, I promise. When they start to brown they go fast! Continue browning them until they are caramel and fill your kitchen with glorious onion smell! 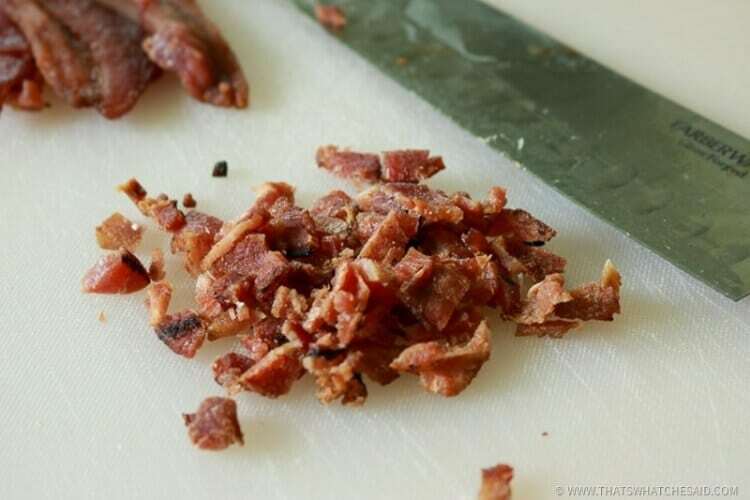 Next I chopped up some of the Bacon Jerky. You could also fry up some bacon but this is already hickory smoked, already made and delicious and I just had to open a bag. EASY! Add this to your onions and give it a nice stir! For traditional Alsatian style tart, the chef would preheat a baking stone for 1 hour in a 500 degree wood fire oven to get a super crispy crust. Well that’s not happening in my house so I opted for these (delicious on their own) Sea Salt & Rosemary Flatbread crackers to act as our crispy crust. In place of ricotta, I added this (delicious on it’s own as well) Laughing Cow Spreadable Cheese. About 1 wedge per 4-5 crackers. A thin layer spread evenly. Now add a layer of your onions and bacon and then top with a small pinch of Herbs de Provence over the top. Enjoy! These are amazing. They take about 15 minutes however look like you have a 5 star chef in your kitchen who whipped them up! 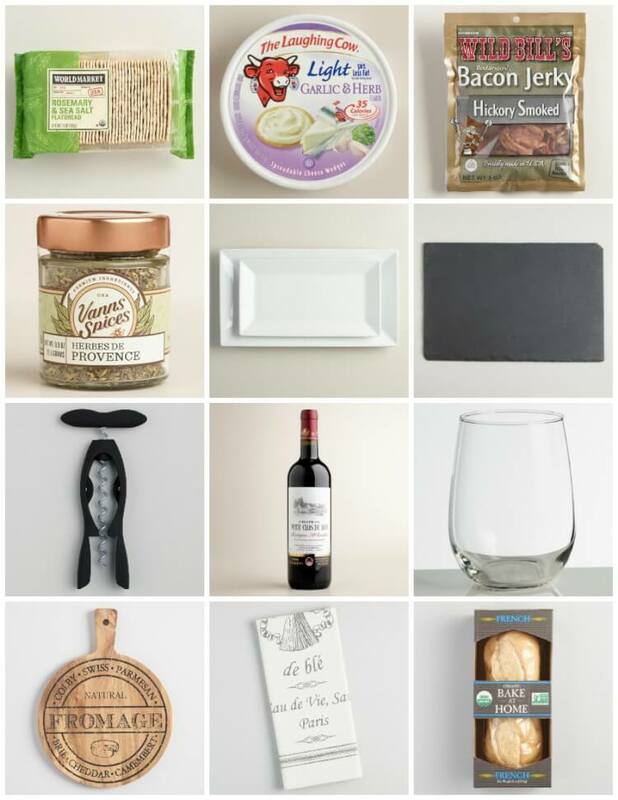 To serve, place them on a Large Rectangle Platter or my favorite, this slate platter! 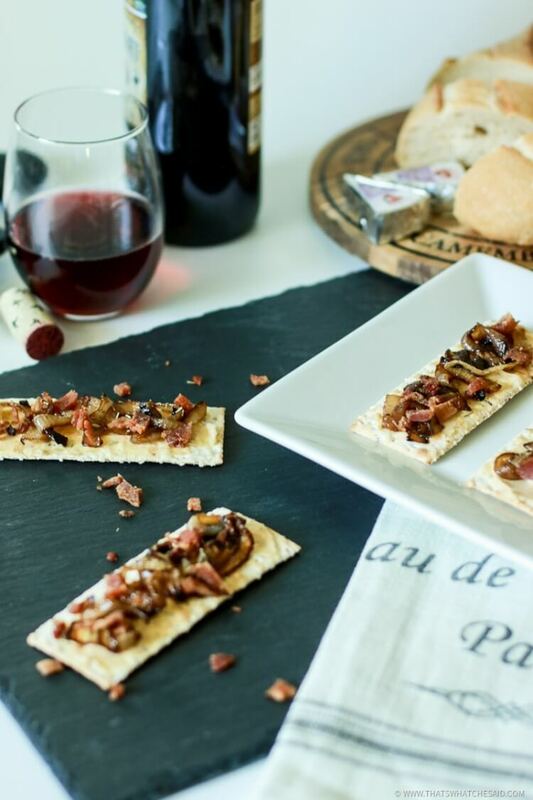 The fun cutting board that is under the bread in this picture is also super fun with it’s French Flair and would be perfect for some cheeses and grapes! 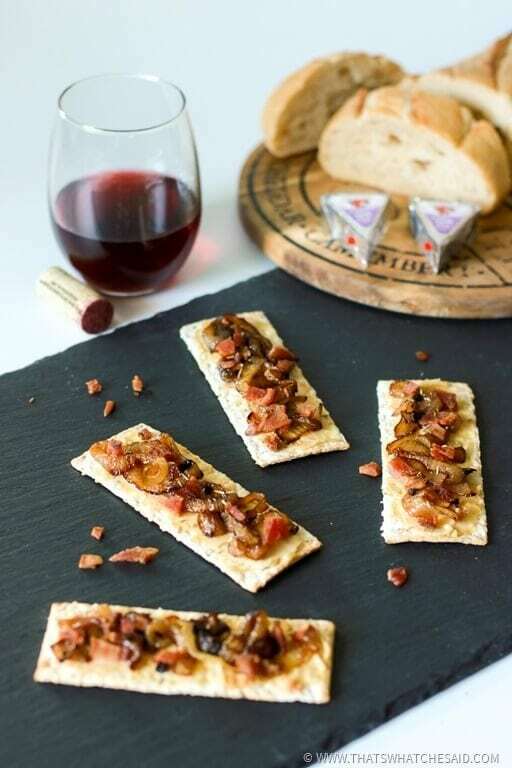 Add your favorite French wine and you have the perfect little appetizer to enjoy as you sit around with friends! Cost Plus World Market not only makes it easy to make these gourmet bacon and onion tart appetizers, but also makes it super easy to serve them in style. I could honestly browse the store for hours and hours. Here is what I used! Click the images to be taken to the appropriate links! 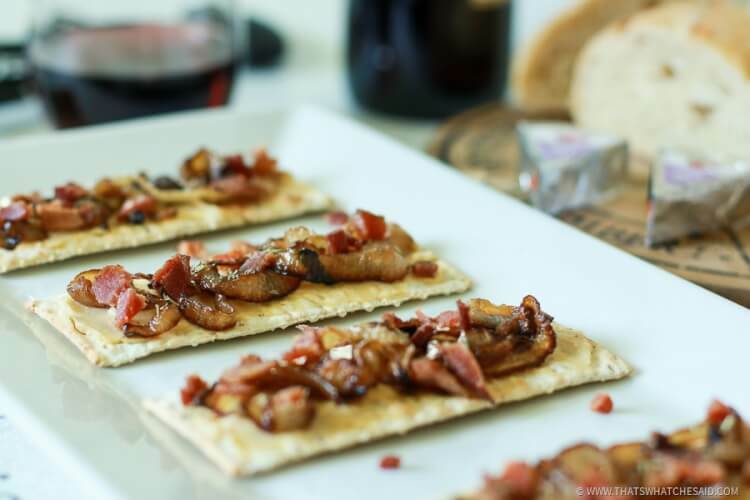 A simple twist on a classic Alsatian Bacon & Onion Tart (Tarte Flambee) Crunchy flatbread crackers replace the crispy tart shell and the combination of bacon and onions will have your taste buds dancing! Slice Onions in equal size slices. 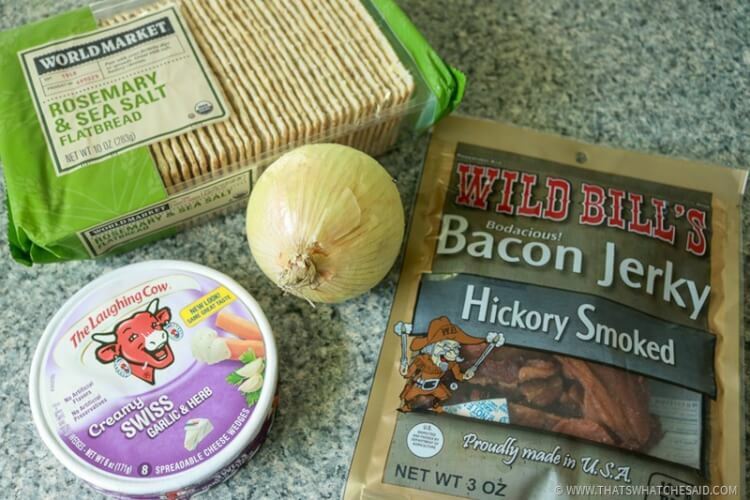 Chop bacon jerky and add to onions, Stir. 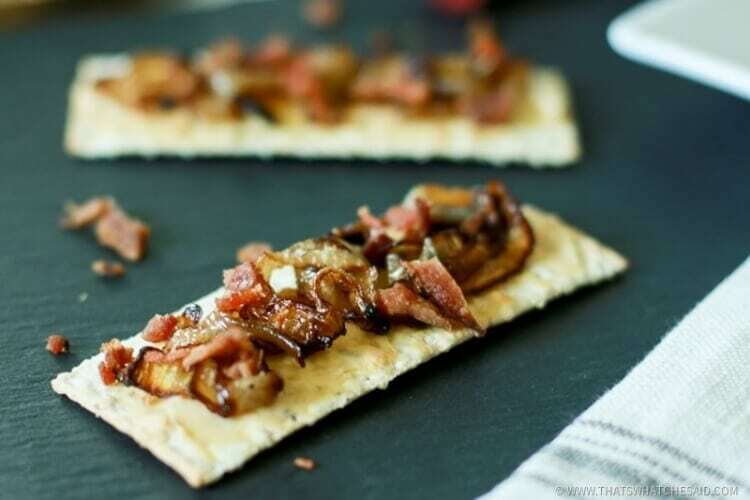 Spread thin layer of cheese on flatbread crackers and add layer of onion mixture. Top with a pinch of Herbs de Provence. Love Cost Plus World Market as much as I do? 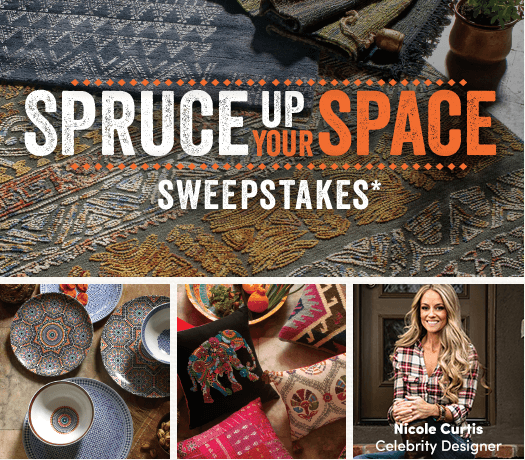 Then enter the Spruce Up Your Space Sweepstakes! 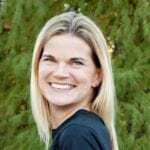 One Grand Prize Winner enjoys a $5,000 Cost Plus World Market Shopping Spree & Design Consultation with Celebrity Designer Nicole Curtis. 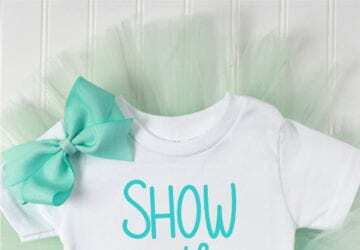 Three First Prize Winners will enjoy a $1,000 Cost Plus World Market Gift Card. Sweepstakes ends 9/30/2016 and you can enter here! Thanks Leanne! I hope you love it! I’m down for anything with caramelized onions. Throw in some bacon and I’m in heaven. Trying this for sure!